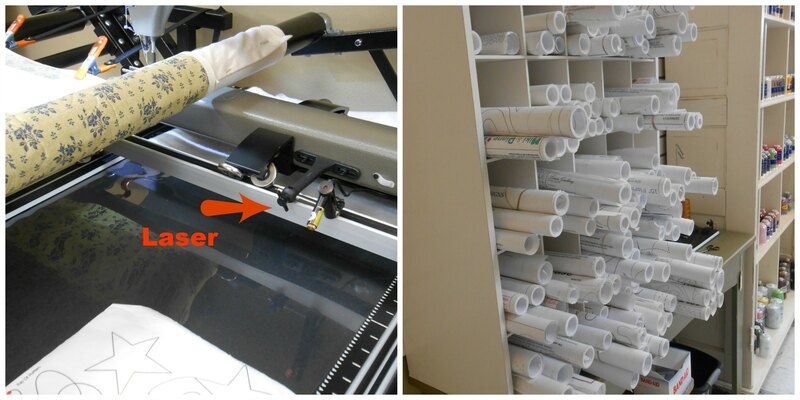 Everything you need to know about the long-arm quilting machines. Ask us your questions. 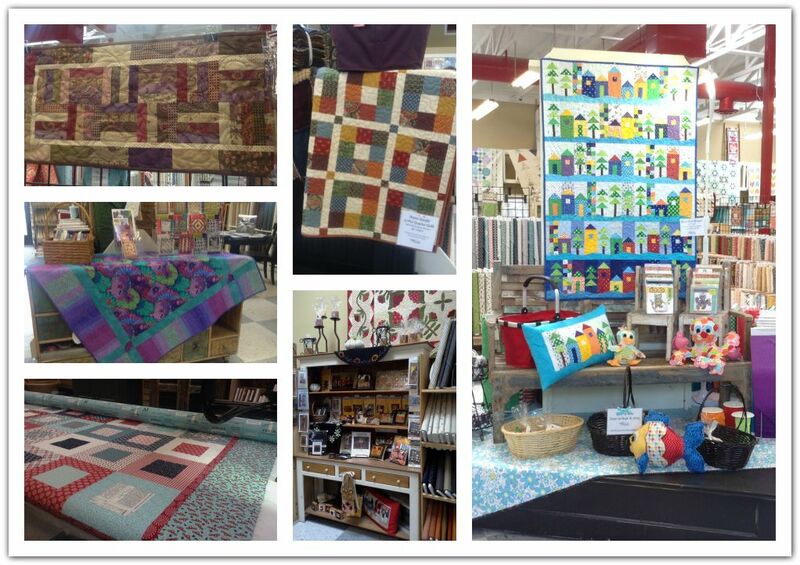 I’ve been quilting for just a couple of years, mostly small lap-sized pieces. 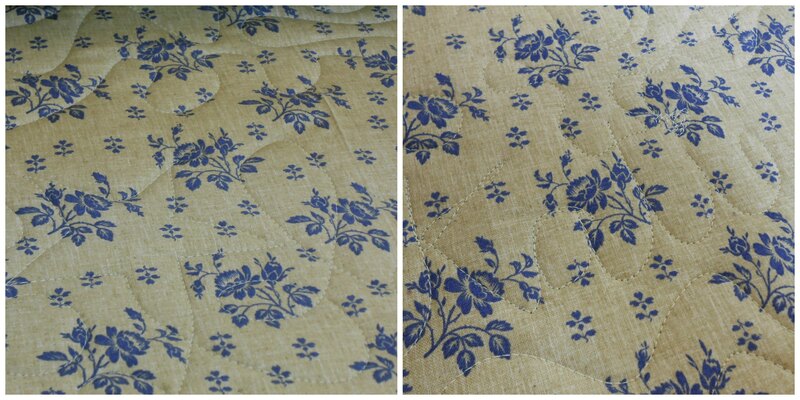 I’ve been pretty successful at quilting them on my regular sewing machine. Several larger items, though, became a source of entertainment in our house while I was not so successfully quilting them. 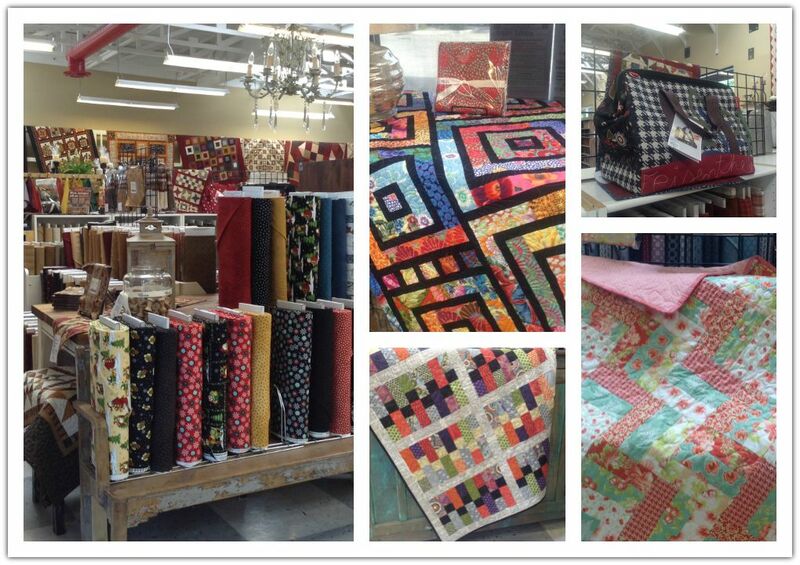 This summer, I was wrestling a heavy, twin-sized quilt through my machine at my kitchen table. My husband always seemed to come in as I was trying to force the quilt into that tiny space to the right of my needle, most of it thrown over my shoulder, squinting as I tried to see where I was going and trying very hard to avoid sewing my finger to the quilt. He enjoyed the entertainment. Oh yeah, it was fun!! If you’ve ever been inside the store, you’ve likely heard the hum of at least one and usually most of the five long-arm machines. 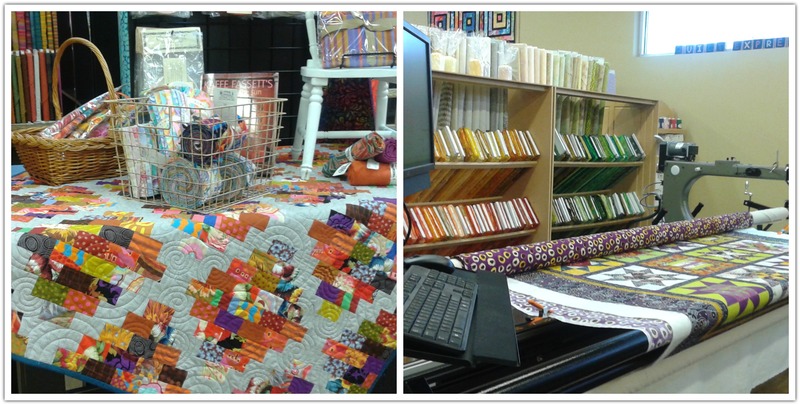 I love to walk by and admire the quilts that are stretched across the machines. 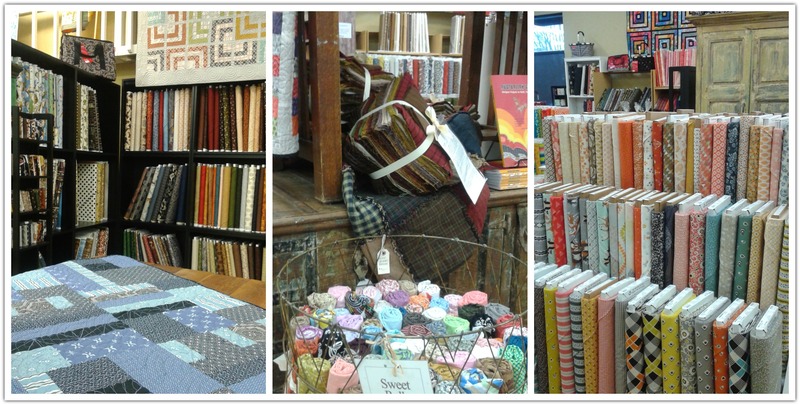 I’ve envied those that come in, work for several hours (without a quilt thrown over their shoulder!) and leave with a completed, beautiful quilt with just the binding left to do. It’s been a goal of mine to learn how to use the machines. 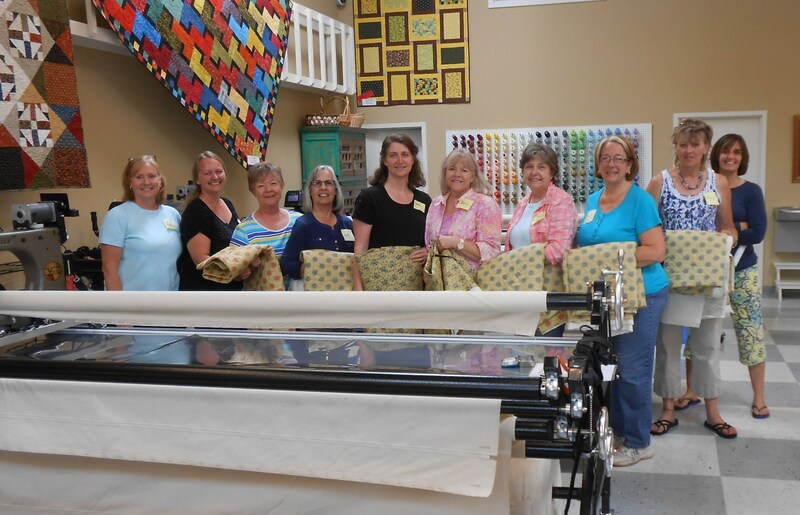 I must have expressed this desire loud enough and in the presence of the right person because my name was added to the class list for one of the August sessions of Introduction to Long Arm Quilting. When I showed up to class, I was an equal mixture of nerves and excitement. Why nerves? I’ve always been afraid I’d break one of them! And the excitement? I’d no longer be such a source of entertainment at home. 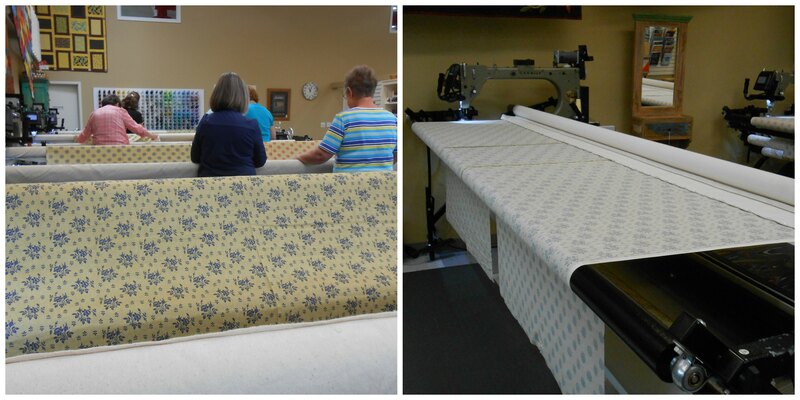 Our class consisted of myself and seven lovely ladies, all eager to learn how to long-arm quilt their own quilts. One of them mentioned that she’d completed one quilt top and had promised herself that she’d completely finish it before she started another. 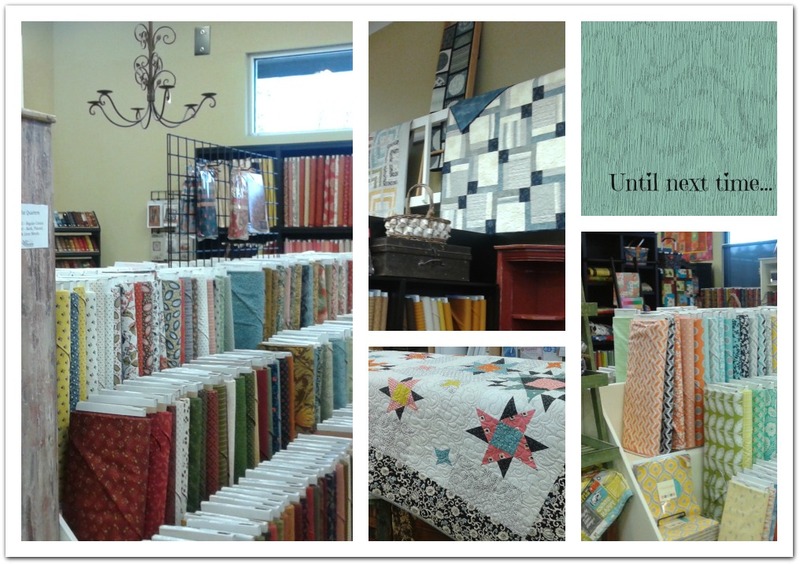 Another told us that she had a pile of quilt tops just waiting for her to complete this class. 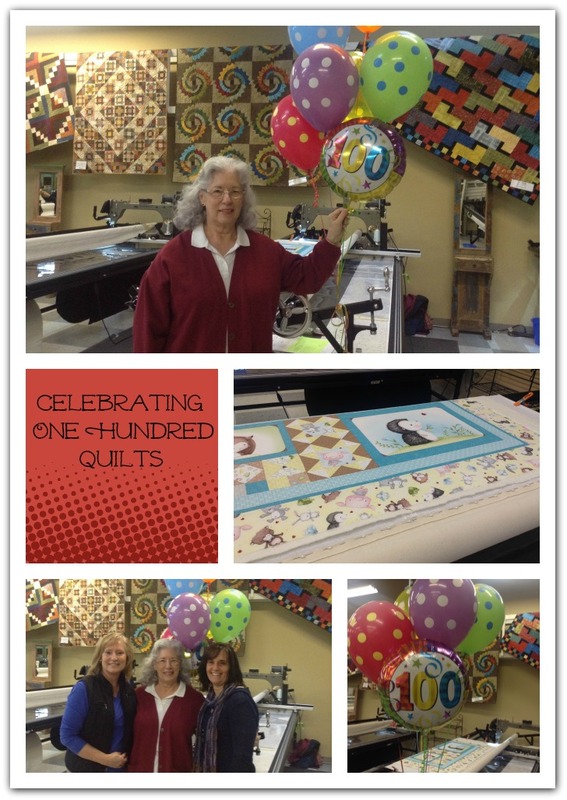 Our teachers were Rodi and Tracey; both of them have been long-arm quilting at Quilt Expressions for many years. 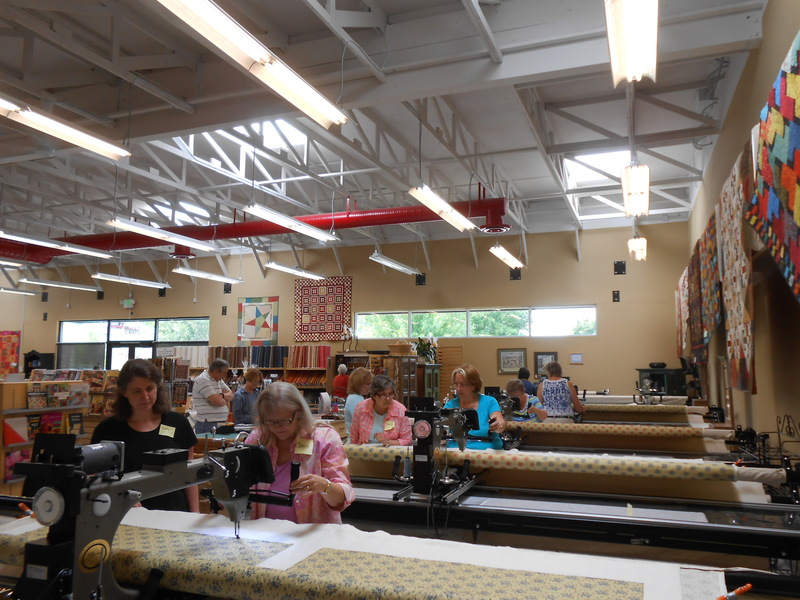 We were paired off and loaded two quilts per machine. While one ran the machine, the other watched and assisted in trying to remember the steps in the right order. 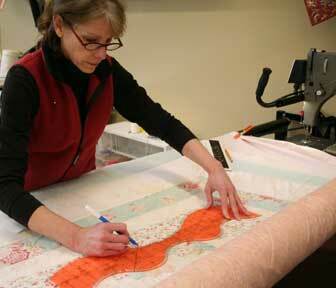 We each had the opportunity to both free-hand quilt and quilt using a pantograph. 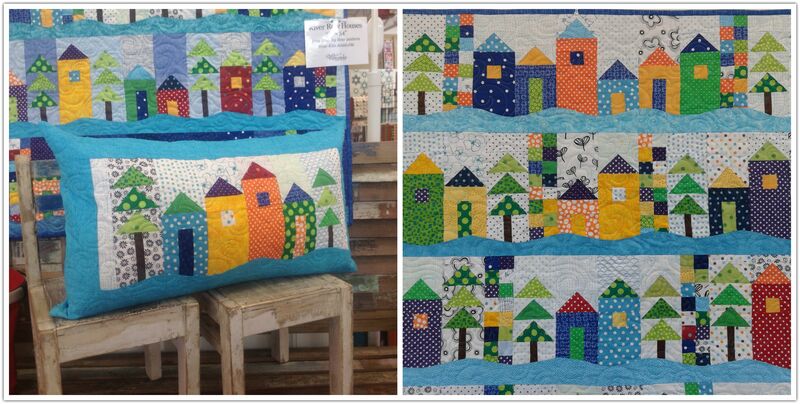 I’m not sure which I like best…free-hand quilting is a lot of fun. 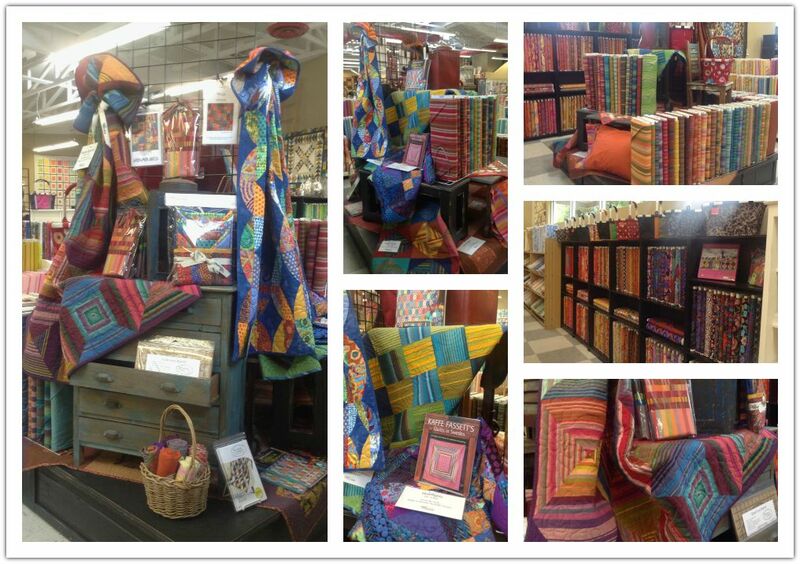 You can just about quilt any design you can think of. However, I do love the uniformity that comes from using the pantograph. Can you pick out the star in the photo on the left and my name (Katie) in the photo on the right? What’s a pantograph? A pantograph is a continuous design that is printed on a long sheet of paper. A laser attached to the machine is lined up on the pantograph. Standing at the back of machine, you simply follow the design with the laser. It sounds easy…and it really is! 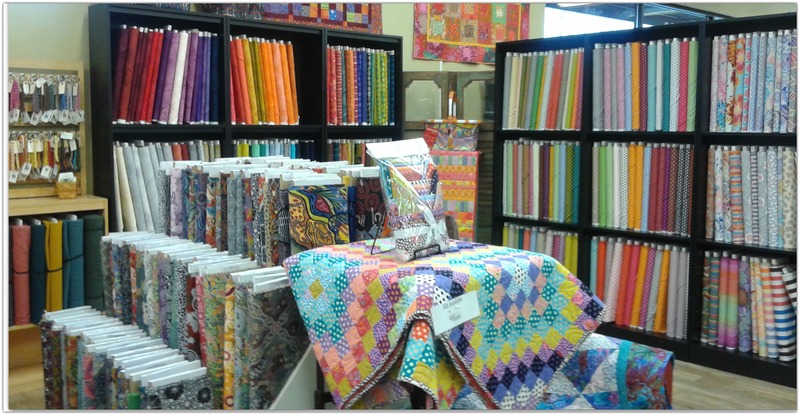 Quilt Expressions has many pantographs to choose from. Each of the rolls in the photo on the right is a different design. The hardest part is choosing which one to use. Once you’ve completed the class, you’re able to rent the machines by the hour. On the back wall near the machines is a wall covered with a delicious array of colorful thread. 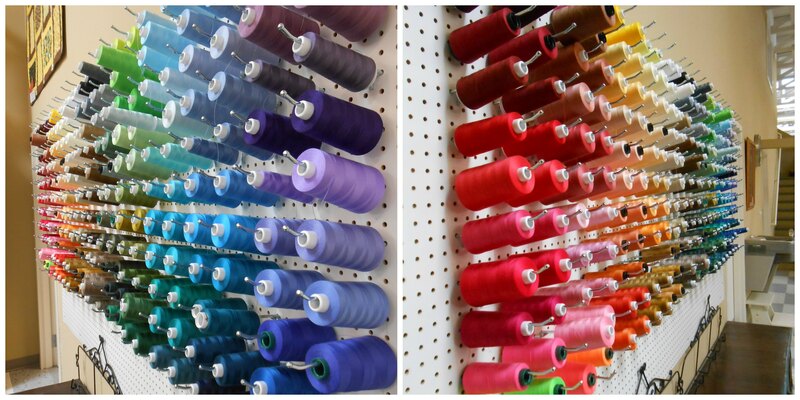 You can choose any color on the wall for your quilting, and the cost of the thread is included in your fee. Well, we did it! We survived the eight hour class….and enjoyed it! Now, the most important thing to do is practice, practice, practice. It’s definitely a technique that will be forgotten without use. Luckily, either Rodi or Tracey are always available for questions and assistance while we’re using the long-arm machines. My first real test of how well I retained everything I learned will be when I quilt my Super Six, once it’s completed. 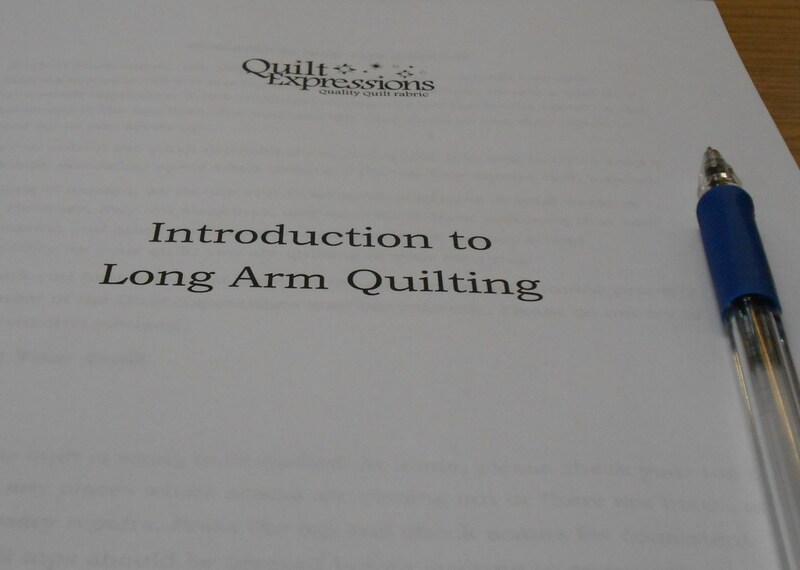 I’d love to find out what experience our readers have with long-arm quilting. Have you taken the class? Do you rent our machines regularly? Do you own your own long-arm machine? Do you use the valet service? 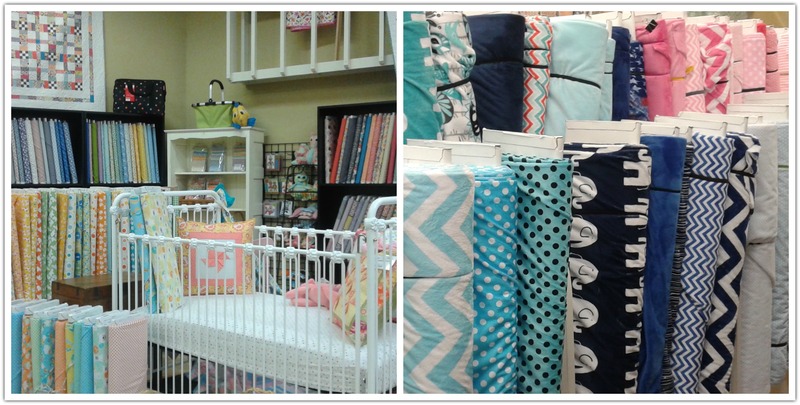 Have you tried the zippers? 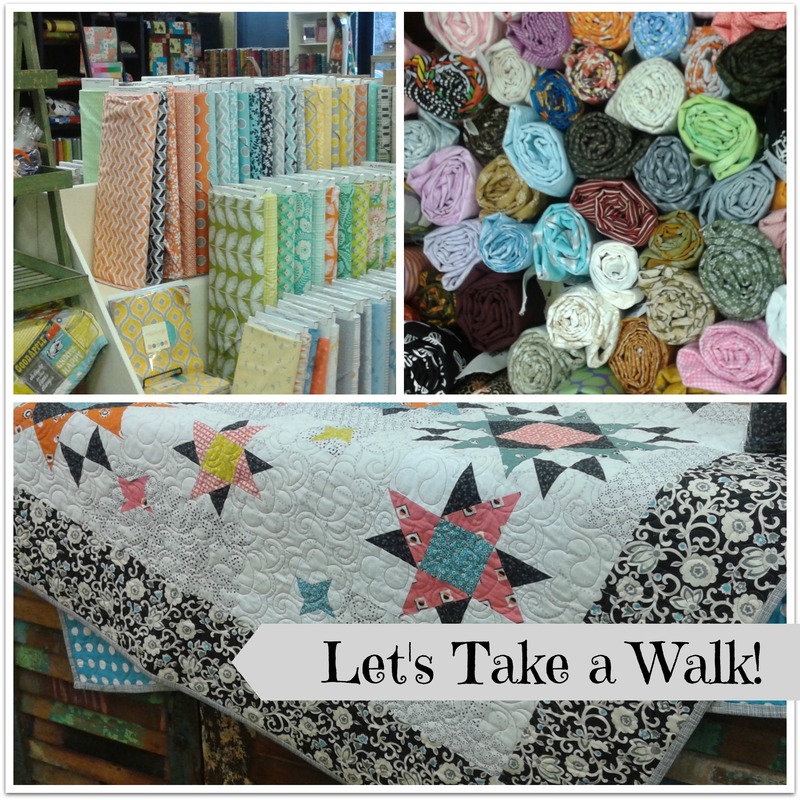 Do you drop your quilts off at the store to be quilted by us? 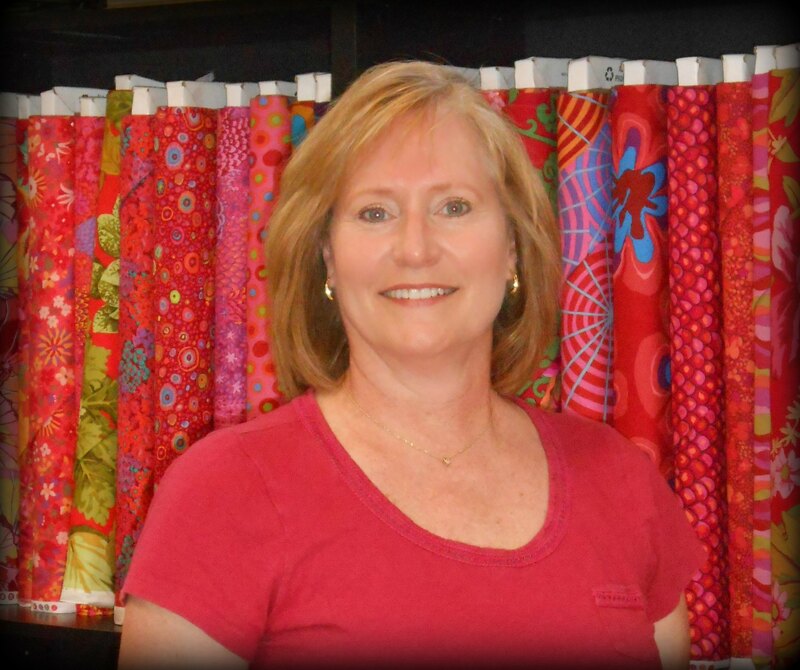 Do you use your regular machine to quilt and love it? Please leave a comment and let me know! I’ve got a brand new “toy!” plus a new quilting technique I thought I’d share. The toy isn’t meant for quilting; it’s actually an applique template that you’re supposed to use to cut perfect, flowing leaves. But, I bought it just to make perfect flowing feather spines. I love it! This past week I finished quilting a custom quilt, and my new toy made it so easy to mark the spines with a nice curve–all I had to do was then fill in the feathers. My favorite marking tool for light fabrics is a blue “mark b-gone” water erase pen. 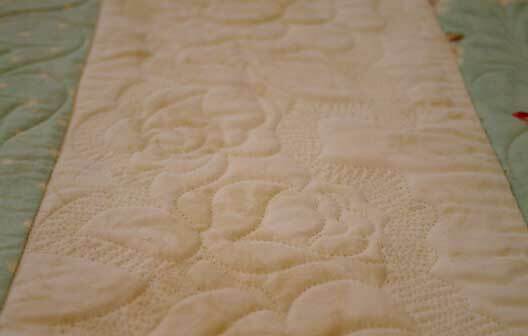 On the white cream borders, I tried a new idea I saw a while ago on another quilt. Of course my memory was a little foggy, so I was making some of it up as I went along! This technique worked so well I had several folks ask me if it was trapunto when they saw the finished quilt–and no, it isn’t! 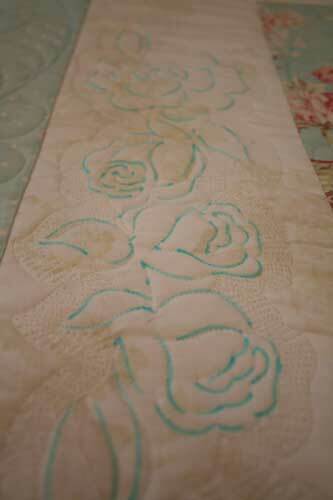 I used a template to mark a rose with my blue pen, then made a first pass through the border stitching on the lines from the template. Next I outlined the design with a 1/2″ echo. And then the fun began! I “scribble” stitched a back and forth line, filling in the echo. A little water squirt took out the marking, and I had a gorgeous border design. It came out pretty well, if I do say so myself!